What does someone who has been inconsistently blogging do to become more consistent? Throw herself into the deep end! That’s right: for the month of November I’ll be participating with Kim (Sophisticated Dorkiness), Julie (JulzReads), Sarah (Sarah’s Book Shelves), Katie (Doing Dewey), and Lory (Emerald City Book Review) for a month long celebration of everything nonfiction! You can read more about the history of Nonfiction November blogging challenge on her post here. 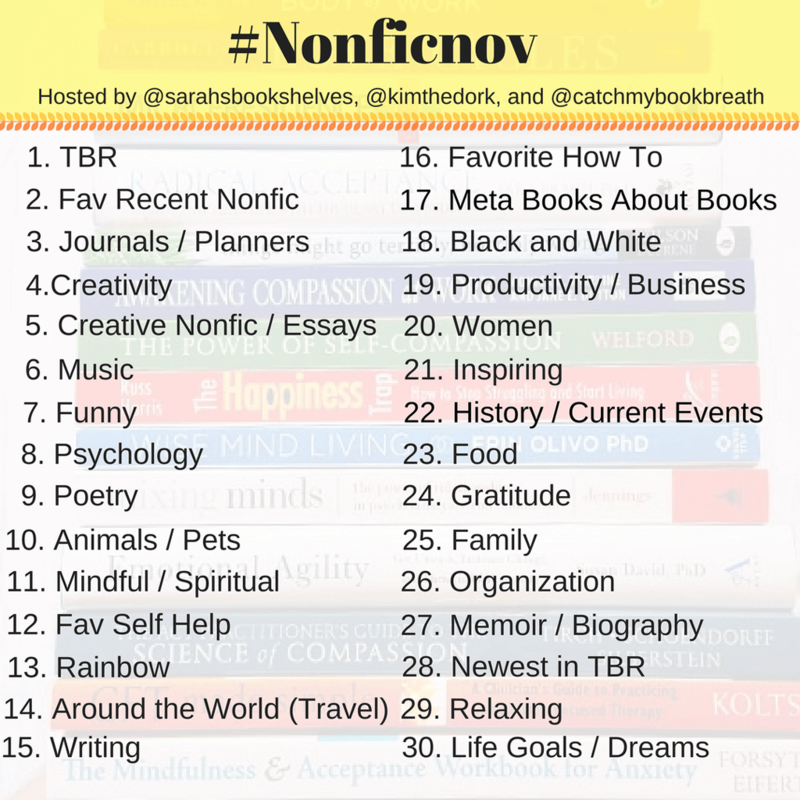 Week 1: (Oct 30 to Nov 3) — Julie @ JulzReads — Your Year in Nonfiction: Take a look back at your year of nonfiction and reflect on the following questions – What was your favorite nonfiction read of the year? What nonfiction book have you recommended the most? What is one topic or type of nonfiction you haven’t read enough of yet? What are you hoping to get out of participating in Nonfiction November? Week 2: (Nov. 6 to 10) — Sarah @ Sarah’s Book Shelves — Book Pairing:This week, pair up a nonfiction book with a fiction title. It can be a “If you loved this book, read this!” or just two titles that you think would go well together. Maybe it’s a historical novel and you’d like to get the real history by reading a nonfiction version of the story. Week 3: (Nov. 13 to 17) — Kim @ Sophisticated Dorkiness — Be The Expert/Ask the Expert/Become the Expert: Three ways to join in this week! You can either share three or more books on a single topic that you have read and can recommend (be the expert), you can put the call out for good nonfiction on a specific topic that you have been dying to read (ask the expert), or you can create your own list of books on a topic that you’d like to read (become the expert). Week 4: (Nov. 20 to 24) — Katie @ Doing Dewey — Nonfiction Favorites:We’ve talked about how you pick nonfiction books in previous years, but this week I’m excited to talk about what makes a book you’ve read one of your favorites. Is the topic pretty much all that matters? Are there particular ways a story can be told or particular writing styles that you love? Do you look for a light, humorous approach or do you prefer a more serious tone? Let us know what qualities make you add a nonfiction book to your list of favorites. Week 5: (Nov. 27 to Dec. 1) — Lory @ Emerald City Book Review — New to My TBR: It’s been a month full of amazing nonfiction books! Which ones have made it onto your TBR? Be sure to link back to the original blogger who posted about that book! To add to the fun, because I love Instagram and I was dying for a nonfiction challenge on Instagram, so I asked around to see if anyone wanted to participate. Kim stepped up and said she’d love to help so we came up with daily prompts (and I tested my patience with graphics). Sarah (@SarahsBookShelves), Kim (@KimTheDork), and I (@CatchMyBookBreath) will be hosting. Feel free to share on your blog and your #bookstagram feed! We’ll be using the hastag #nonficnov – come join us! So #nonficnov hashtag for twitter as well then? Good Luck! 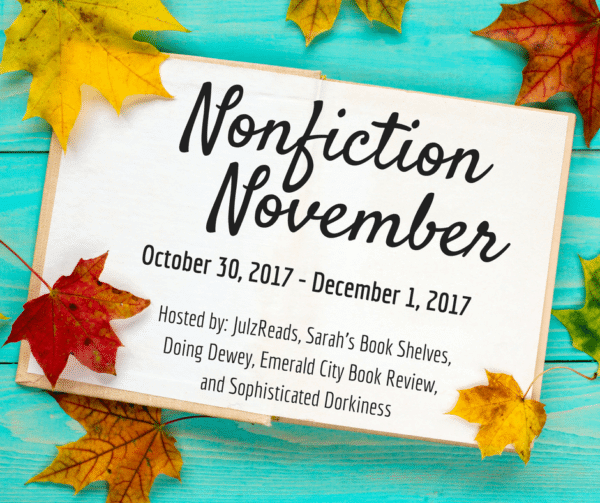 I’ve been pretty inconsistant with my blogging this year, too, but I’m hoping Nonfiction November will give me the jump start I need!